I likes exercising with the Wii Fit but it’s not really a work out. We went out looking for the EA Active, but we found the Everlast 3″ Aerobic Step on the shelf in the Wii section instead. 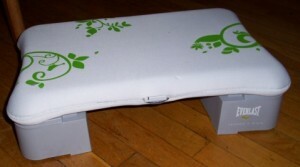 This Wii Fit board accessory turns the Fit board into … well a 3 inch aerobic step. With the attachment, the regular Wii Fit step exercises is intensified. It’s a great way to have a fun workout and actually feel like you actually worked your muscles. I highly recommend this accessory if you are using the Wii Fit to try to get in shape. Note: Do not do the body test with the step accessory attached. The Wii Fit will miscalculate your weight by 50 to 70 pounds!